She spent nearly all of that time as editor and used that position to drive the paper toward relevance, usefulness and necessity for the tens of thousands of county officials who read and shared each issue around the office. She retired from NACo at the end of 2018. Tom Goodman, who started as NACo’s public affairs director within a month of her hire, saw that drive every week. A Washington County, Md. native, Bev headed to Pittsburgh for college and began her career as a social worker, public relations specialist and a reporter at a weekly paper covering Allegheny County suburbs. As a social worker, she successfully challenged the plan to institutionalize the six-year-old son of a mentally-limited mother who herself had been misidentified as mentally challenged, an achievement she called her “proudest moment” in 1992. When she expressed an interest in moving to the Washington, D.C. area, her managing editor called her son, who was then County News’ editor, and instructed him to hire her, personal friend Georgette Blanchfield recounted. Within a year, she settled in Fairfax County, Va. and a year later, assumed the job of editor. Her NACo tenure was inspired by a drive to learn about the country and get to know the men and women who worked in county government, and she formed a fast friendship with Kay Braaten, then a Richland County, N.D. commissioner who served as NACo’s president from 1991-1992. “She’s honest and thoughtful and everything you want in a coworker and as a friend,” Braaten added. As an editor, Bev was driven by the urge to break news, be timely and compete with anyone. She blanched when people referred to County News as a newsletter, former Senior Staff Writer Charles Taylor recalled. Former Senior Staff Writer Mindy Moretti saw the same in Bev, but as a reporter just starting her career. “Having Bev as an editor made me a better writer,” she said. “Editing is part of what I do now and she made me better at the job that I do. She was great about allowing us to have our niche and develop skills and expertise in a topic. Bev’s drive was put to the test Sept. 11, 2001. After the attack on the Pentagon, the NACo office was cleared, but County News was in the middle of a production week. Some of the biggest news in the nation’s history was breaking, but circumstances were preventing her paper from playing a part. 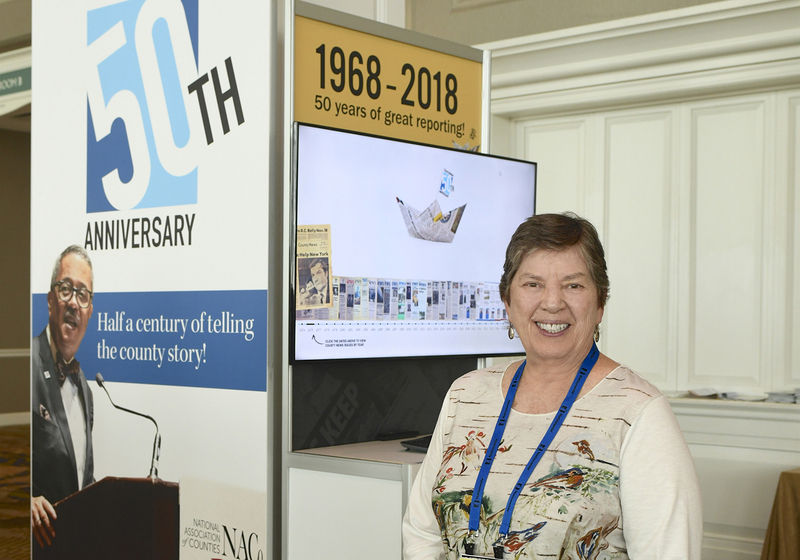 When honored for her 30 years of service to NACo, Executive Director Matt Chase reported that what Bev recalled the most about that time was 9/11. Her determination on display in 2001 wasn’t an aberration, though. During a snowstorm one Thursday night of a production week, she lobbied then-Executive Director John Thomas to finance hotel rooms for the production staff, so they could work without anxiety over travel before or after their jobs were done, Goodman recalled. Throughout her 30 years, she never missed a publication deadline, sometimes trekking up to the Montgomery County, Md. printing facility to troubleshoot in the middle of the night. Away from the newspaper, she served as staff liaison to the Women of NACo and represented the delegation on a number of trips, including one to Japan in 2011. Bev is a technology enthusiast and was an early adopter of social media and driver of the County News website’s development. She is fascinated by the potential of innovations like unmanned aerial vehicles (drones) and augmented reality. She balances that with a low-tech love for gardening.